Baron Ferdinand Lidded Vase and Miss Alice Lidded Vase by Kate Malone. ACS artist Kate Malone has long been considered one of the UK’s leading ceramic artists, and her recent appearance on the BBC television series The Great Pottery Throw Down has helped to reignite the nation’s interest in British pottery. 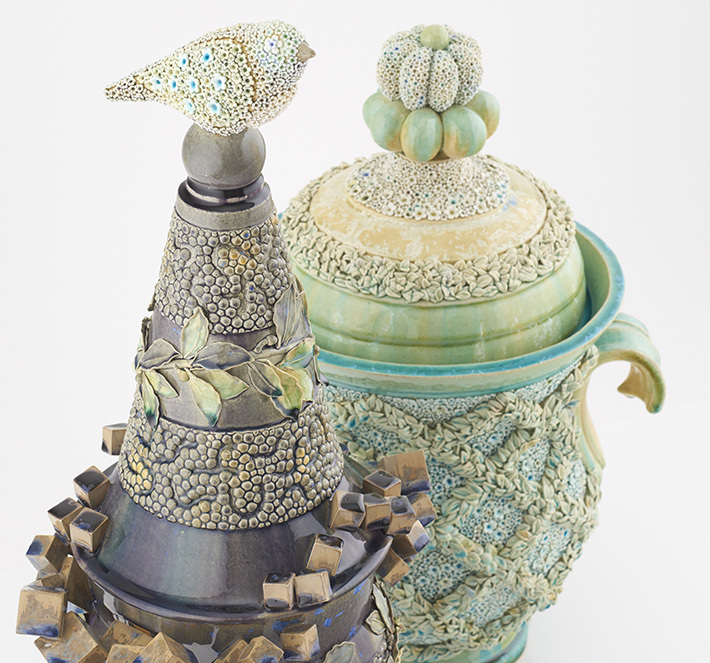 A major new exhibition of work sees Kate Malone combine her contemporary ceramics practice with another much loved British institution. The gardens, collections and archive at Waddesdon Manor have proved to be a wealth of inspiration for the artist, who has produced a significant collection of work now on display at the Manor. From the decorative tassels and fringing seen throughout the furnishings in the property itself, to the gourds and squashes grown in the exclusive Eythrope private garden, created by Alice de Rothschild in the 19th century, Malone has drawn inspiration from Waddesdon in a variety of ways to craft an astonishing range of over 50 ceramic sculptures and vessels. On Wednesday 28 September join Kate Malone herself for a fantastic opportunity to tour Waddesdon Manor. This uniquely organised day will give audiences the chance to visit the Manor and the rarely explored Eythrope Gardens to view first-hand the objects and flora which inspired the artist, before being given a guided tour of the exhibition itself. For more information and to book tickets, please visit the Waddesdon site here.